Roach Demolition recommends allowing sufficient time to plan for your demolition works. There are many steps involved before any demolition work can commence. The information contained in this document, outlines the requirements and procedures necessary for demolition of any building/dwelling. 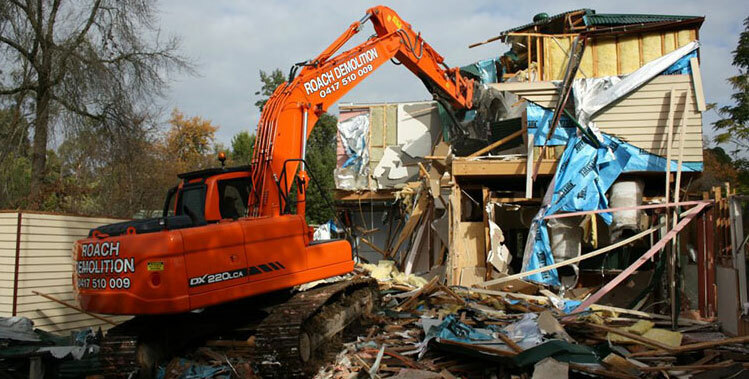 Roach Demolition provides customers with over 20 years experience within the demolition industry, specialising in residential demolition, asbestos removal, and excavation works. Roach demolition performs each demolition project with emphasis on safety, budget and the needs of our clients. We are located in Ringwood, but provide our services all around Melbourne. We often frequent suburbs such as Mitcham, Nunawading & all surrounding areas. All demolition work is carried out in accordance to Australian Standards, Regulations, and Codes of Practice. Roach Demolition is fully licensed and fully insured. At Roach Demolition, we are committed to providing a reliable, affordable and safe demolition service. and helping us through the various steps for the demo.